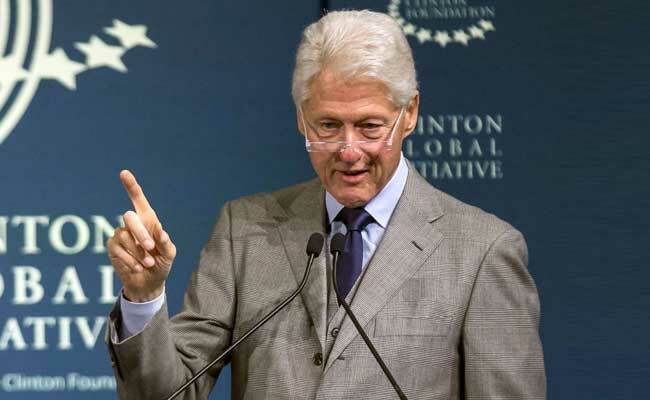 Bill Clinton is collaborating with US author James Patterson on his book "The President is Missing"
New York: Bill Clinton might have hoped to spend this year back in the White House as America's "first gentleman," should his wife Hillary have won the 2016 election. Instead, the two-term Democratic president is moving into fiction, writing his first thriller about drama behind the scenes in the White House, his publishers announced Monday. Clinton is collaborating with bestselling US author James Patterson on "The President is Missing" to be published in June 2018 by Alfred A. Knopf and Little, Brown and Company. The book "will offer readers a unique amalgam of intrigue, suspense and behind-the-scenes global drama from the highest corridors of power. It will be informed by insider details that only a president can know," the publishers announced. It is certainly a world familiar to the 70-year-old, one of America's most popular former presidents but whose eight-year administration was clouded by his 1998 impeachment over an affair with a White House intern. "Working on a book about a sitting president -- drawing on what I know about the job, life in the White House, and the way Washington works -- has been a lot of fun," said Clinton. "And working with Jim has been terrific." The best-selling author of "Kiss the Girls" and "Along Came a Spider" has sold more than 350 million books and holds the Guinness World Record for the most number one New York Times bestsellers, his website says. He called his Clinton collaboration "the highlight" of his career. "Having access to his first-hand experience has uniquely informed the writing of this novel," said Patterson. "I'm a story-teller, and president Clinton's insight has allowed us to tell a really interesting one." Forbes values Patterson at $95 million, calling him publishing's richest and busiest penman who produces more than a dozen books a year with co-authors. Clinton is written a string of books, including his post-office 2004 best-selling memoir "My Life."